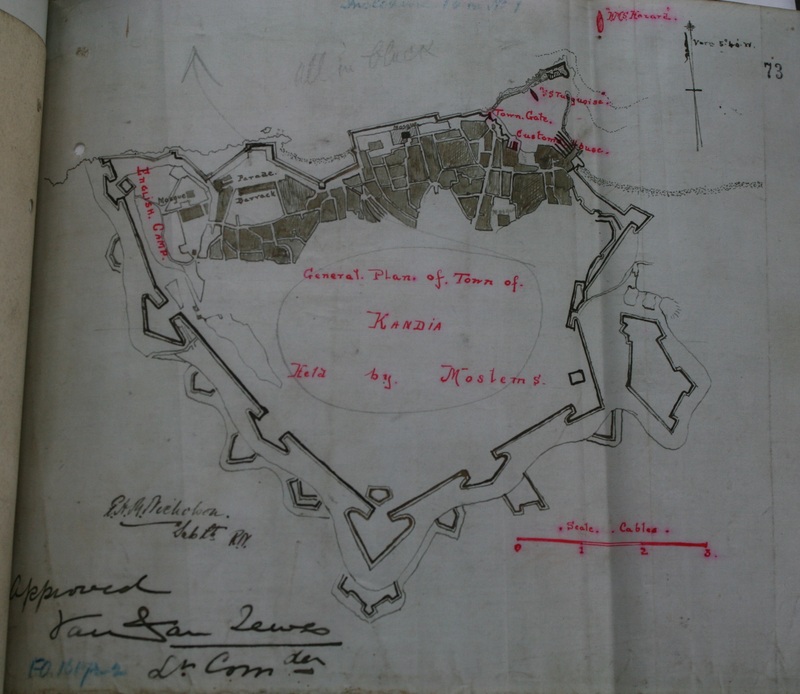 Uncategorized | The British in Crete, 1896 to 1913. 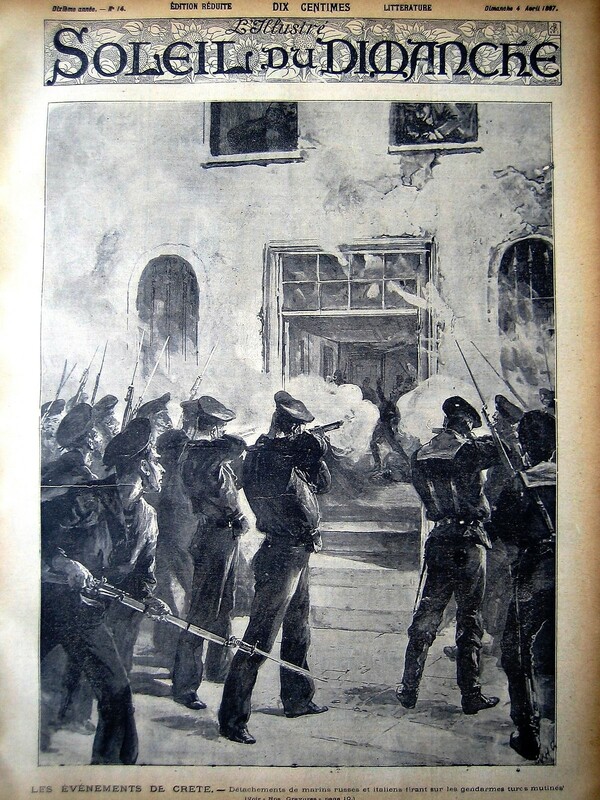 One of the immediate triggers for the European intervention in Crete was the rioting, looting and arson that broke out in Canea, the then capital, on 6th February 1897. European levels of alarm were further raised when that evening, Cretan Christian insurrectionists cut the Suda/Canea road and occupied the Akrotiri peninsula to the east of the town. The rioting in Canea, instigated by Cretan Muslims, was, as far as the European Powers were concerned, a further symptom of the breakdown of law-and-order on the island. Such inter-communal unrest had been growing over the previous months as the Cretan Christian insurrection spread, one result of which being the mass movement of Cretan Muslims from the countryside into the towns and the movement of Cretan Christians in the opposite direction. This movement of people, essentially ethnic cleansing, had resulted on more than one occasion in the massacre of civilians. 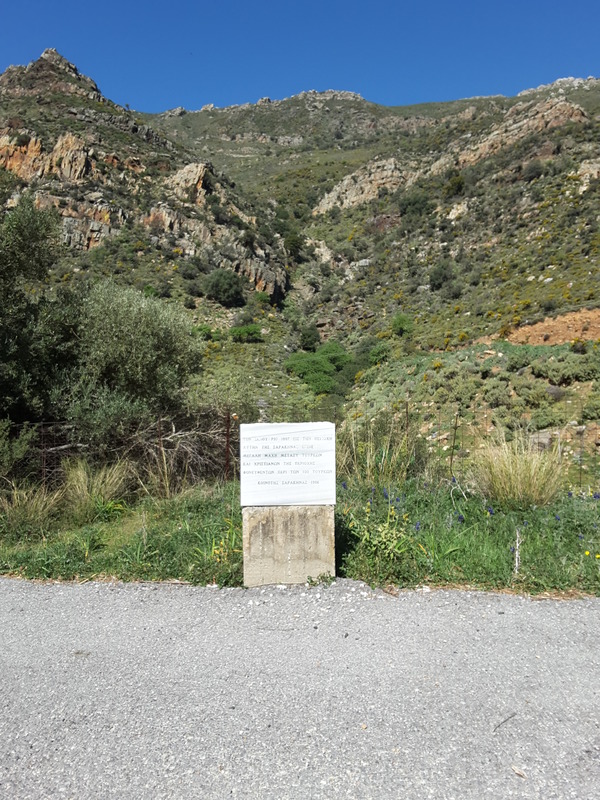 On the left-hand side of the road from Paleochora, south west Crete, to Sarakina, about 2.5km before the village of Sarakina itself, is a small marble plaque set on a concrete plinth and set up by the Community of Sarakina in 1986. This brief description however, though superficially accurate, hides the nature of the battle and the events that lead up to it. By early 1897, the collapse of Ottoman authority and the realisation that Ottoman rule of the island was coming to an end resulted in an increase in inter-communal violence between Cretan Muslims and Cretan Christians throughout the Selino District and many Cretan Muslims, including those of Sarakina, then a predominantly Muslim village, sought refuge in the major towns. Of the 159 Muslims who started, only 44 arrived safely in Paleochora and some of these reported to Biliotti that following the firing, all the wounded men and some of the small children were murdered and four Muslim women from Sarakina had apparently been forcibly taken to a Christian village. Biliotti reports that the massacre was “…deeply deplored by the (Christian) Chiefs and others” but, significantly in the light of his previously highly detailed reports of atrocities committed by both Muslims and Christians throughout the island, makes no mention of any Christian dead or wounded. Biliotti went on to say that ‘…As soon as the news of the massacre were known at Selinos Castelli (Paleochora), twelve Christians, amongst whom a woman and child, residing there, were murdered.’ What appears to be the memorial to one such Christian is situated in a graveyard in Paleochora. Here lies Artemios Opsimakis. 27 years old. Murdered in Paleochora by the Turks. 27th January 1897. Reports of the Sarakina massacre reached England also from the unnamed Times correspondent in Chania. He describes interviewing a survivor on 21st February in a military hospital in Canea, and confirming Biliotti’s report that the Muslims had been offered safe conduct to the sea by the Christians, adding that they did so in exchange for some Christian hostages held in Paleochora. His informant claimed that they were attacked by their guards and by other Christians who appeared from the mountains and that of the 154 Cretan Muslims who started the trek, only 48 escaped of whom 25 were wounded: the informant further alleged that two of his children had been beheaded. In contrast to the punishments handed down after 6th September 1897 for the murder of British servicemen and subjects in Candia, no real effort was made to address the issue of either the massacres perpetrated by Christians immediately prior to the arrival of the Concert forces, or the murders of Christians committed by Muslims on 6th September. The British were ‘…far less concerned with the punishment of those found guilty of crimes against humanity than with retribution upon those who had attacked the British forces which had been performing their duties as instructed’. In the case of atrocities committed against Muslims in the countryside prior to the Admirals taking de facto control of the island, while Biliotti made strenuous efforts to record the victims and to try to start the process of getting justice, albeit within the context of persuading Muslims to return to their homes in the countryside, no enthusiasm was shown by any of the Powers for following the matter up. While legally punishment of these crimes was the responsibility of the Ottoman authorities, unsurprisingly, it is clear that there was no appetite among the Powers to re-open old wounds. In the initial stages of the Intervention, at least up until early 1899 when Christian disarmament became a reality, Christian insurgents, among whom were undoubtedly some, if not all, of the criminals, were in complete charge of the countryside; as a consequence, neither the Ottomans nor the Powers were in a position to enforce their own, or any other, law. With the arrival of Prince George, the Powers were happy to divest themselves of the responsibility; matters were now in the hands of the High Commissioner and the Cretan Assembly and it was up to them to take appropriate action. Similarly, while not pursuing the murderers of Muslims, the pursuit of Muslims who murdered Christians was quietly dropped; the International Military Commission in Canea had, at the request of the Russian Government, ceased to apply the death penalty after execution of two murderers on 23rd November 1898. House of Commons Command Paper (1897) [C.8437] Turkey #10, Inclosure No.249. Bilotti to Marquis of Salisbury (Secretary of State for Foreign Affairs) 22 February 1897. The Times Monday 22 February 1897. Pritchard, ‘International Humanitarian Intervention’ p. 63. 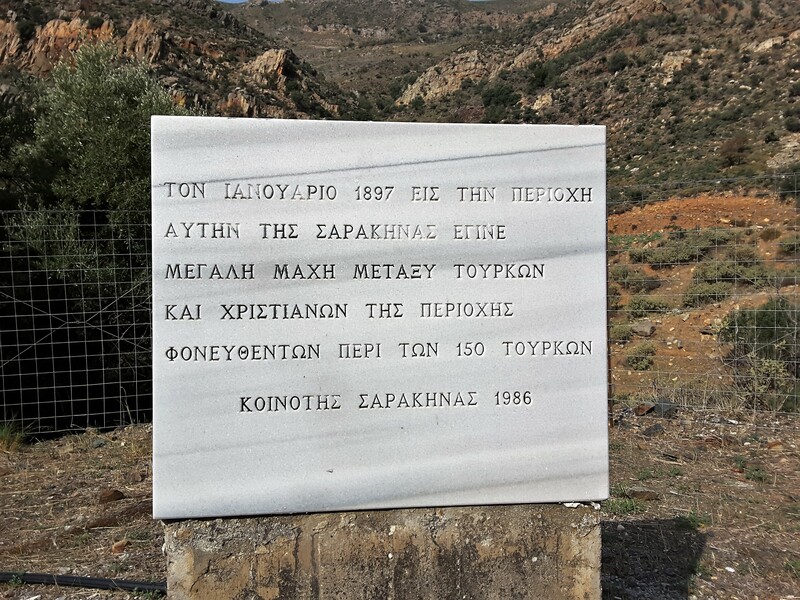 This entry was posted in Uncategorized and tagged Massacre of Cretan Muslims, Paleochora Crete 1897, Sarakina Crete, Selinos 1897, Sir Alfred Biliotti on January 4, 2019 by Mick McT. The origins of the British postal service are to be found in ‘Circular Memorandum No.6’ issued on 22 November 1898 on Chremside’s behalf to the District Commissioners within the British sector and calling for the setting up of six receiving offices, each one staffed by a “…man of confidence, recommended locally” who ‘…must be able , besides reading and writing Greek, to read European adresses.” For receiving the mail, despatching it and selling stamps, it was proposed to pay him a salary of either 30 or 40 francs* per month, depending on the location. A few days later a further circular, No.9, made it clear that the British postal system was to make use of the existing Austro-Hungarian service, the Austrian post office in Candia (Iraklion) being the central office; the reliance on the Austrian service was to the extent that they would provide the new postmen with sealing wax, string, packing paper as well as a seal for the Postmaster. The British service was shortlived running from November 1898 to July 1899 but at least for part of that period, up until 28 February 1899 (O.S. ), it made a profit of £163.0.2d. 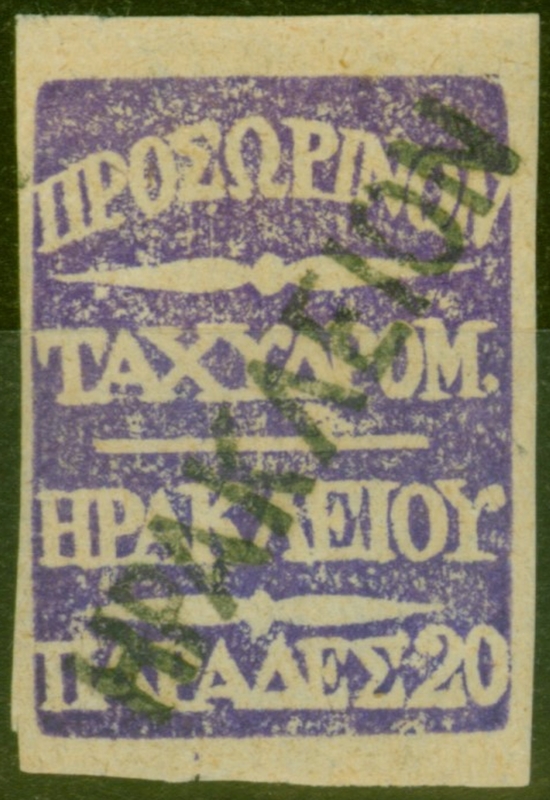 The first British stamps were ordered from a firm in Athens but failed to arrive in time and so, as an interim measure, some 3000 bright violet, hand printed stamps, based on a design produced by the Austrian Director of Post in Candia, were produced. The definitive stamps eventually arrived in December 1898. Examples of British issued stamps. 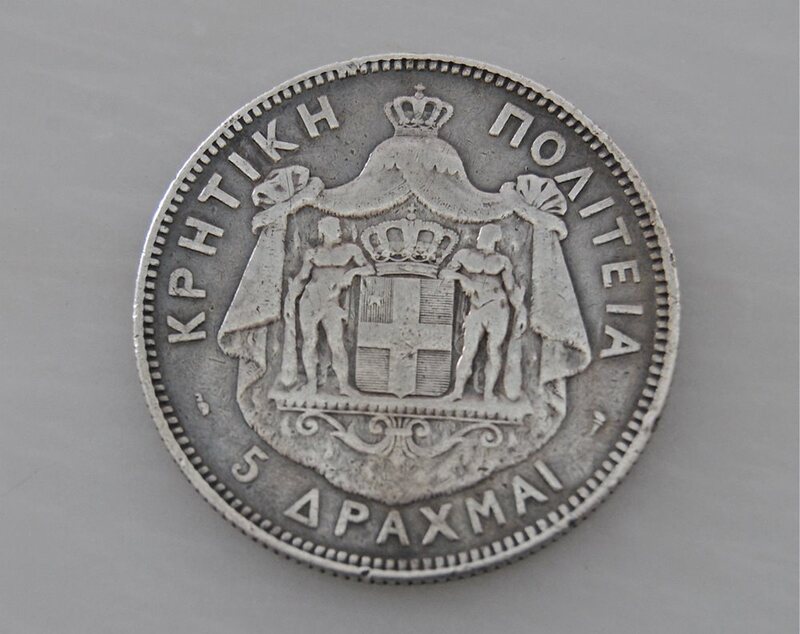 As would be expected given that Crete was still technically Ottoman, the value of the stamps was defined the currency of the Ottoman Empire and the initial stamps were worth 10 or 20 ‘Parades’, the British spelling of ‘paras’; 40 paras making one piaster, and approximately 112 piastres making £1 sterling. 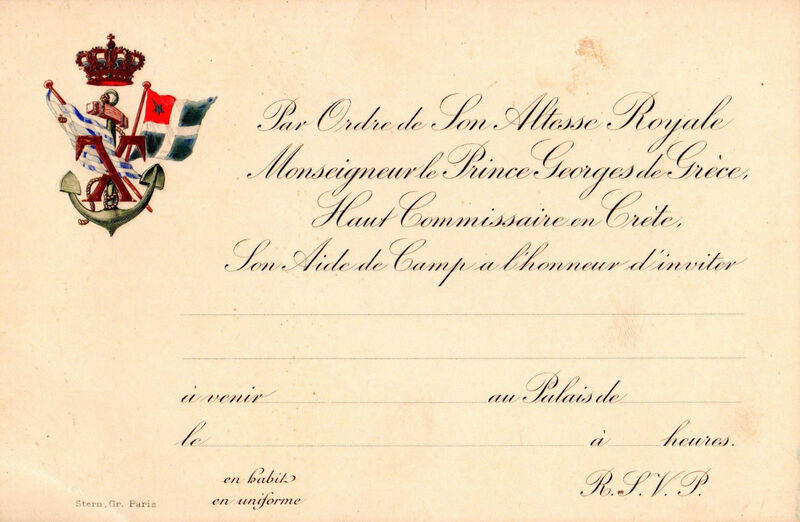 An inland letter within the British sector cost 10 or 20 paras depending on its nature and an international letter, or one to another international zone of occupation, cost 1 piastre. The British postal service, which delivered mail free for British, and latterly French, troops on the island, remained in operation until 24 July 1899, the stamps continuing in circulation and use until 1st March 1900. The other occupying Powers maintained their postal services for longer, the Italian service finishing only in 1914. 1899 [C.9422] Turkey. No. 2 (1899). Report by Her Majesty’s Commissioner in Crete on the Provisional British Administration of the Province of Candia. Ibid. Circular memorandum No.9 in Inclosure 1. Ibid. Circular Memorandum No.39 in Inclosure 1. 1899 [C.9422] Turkey. No. 2 (1899). Report by Her Majesty’s Commissioner in Crete on the Provisional British Administration of the Province of Candia. Circular Memorandum No.9 in Inclosure 1. 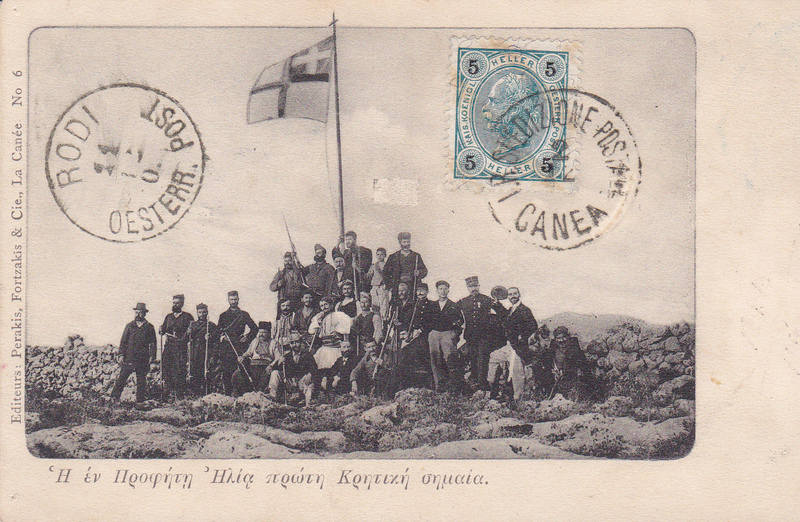 This entry was posted in British Army in Crete, European Intervention Crete, Uncategorized and tagged British postal service in Crete, Crete 1898, European Intervention Crete, Fake stamps Crete, Post Office Crete on December 29, 2018 by Mick McT. The illustrations below are intended to accompany an article, currently in preparation, on the selection of a flag of the Κρητική Πολιτεία. 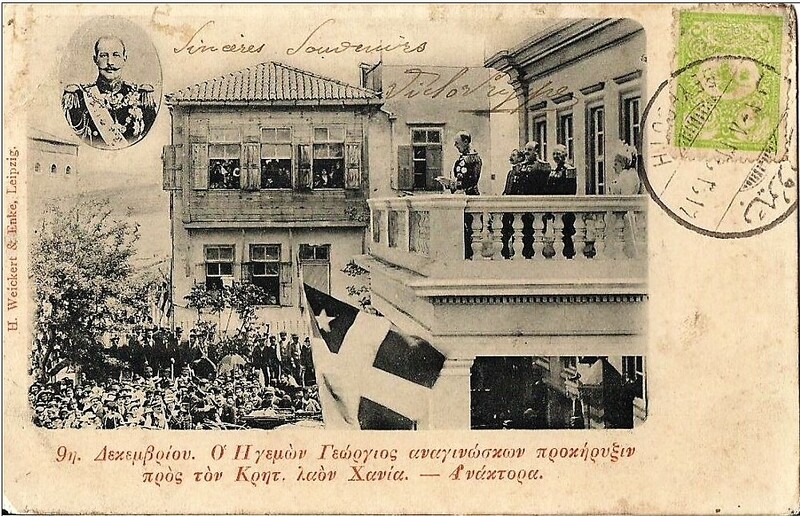 Ottoman postcard of Crete with Ottoman flag. c 1897. 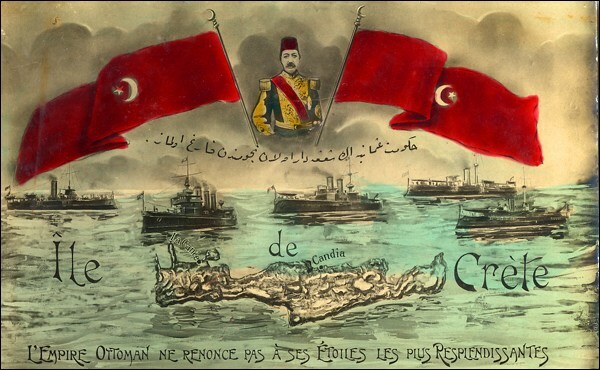 Bashi Bazouks departing Canea under Ottoman flag. 1897. 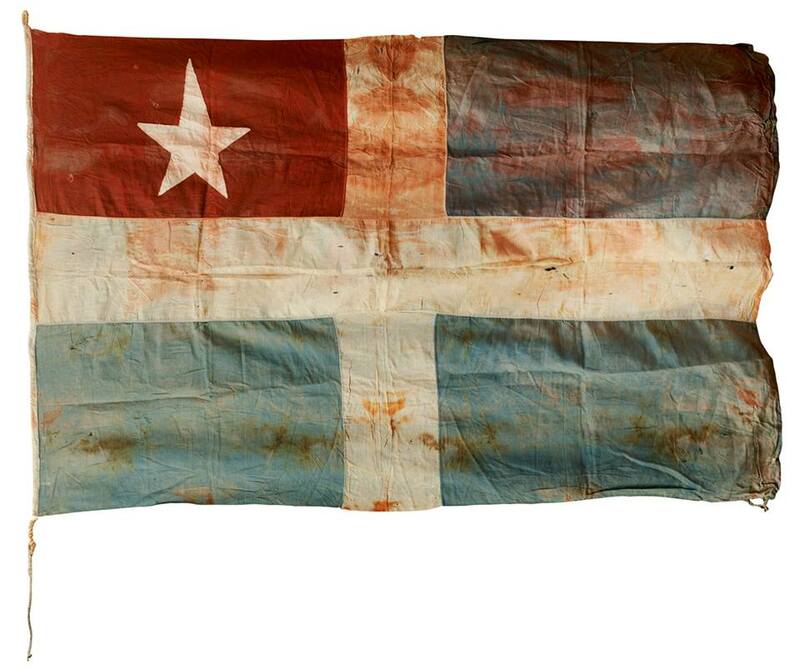 Revolutionary flag of 1897. Iraklion Historical Museum. October 2018. 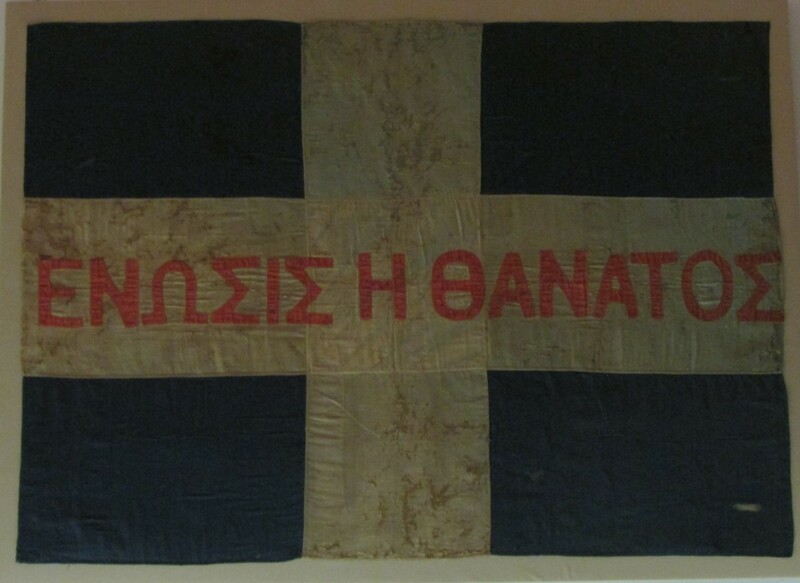 Flag of the Revolutionary Corps of Sitia, 1897. Iraklion Historical Museum. October 2018. The flags of the Powers over Canea. The Graphic, 6th March 1897. 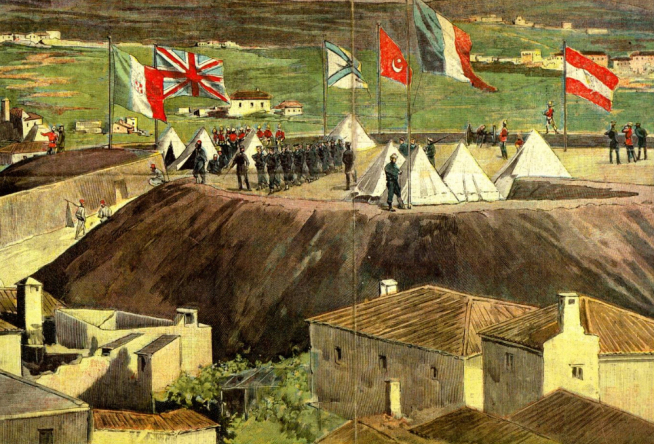 Coloured Postcard of the Powers’ flags over Canea. c.1897. 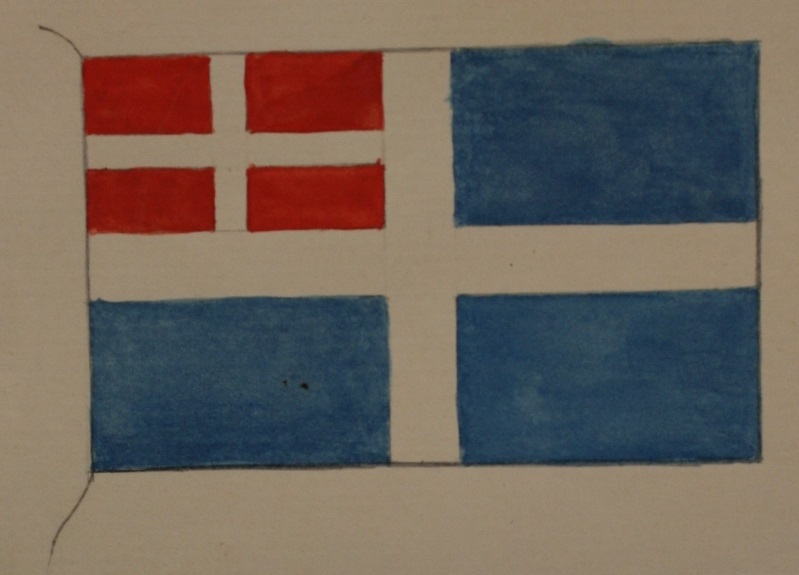 Sketch of Cretan flag proposed by Admirals. Noel papers, National Maritime Museum. 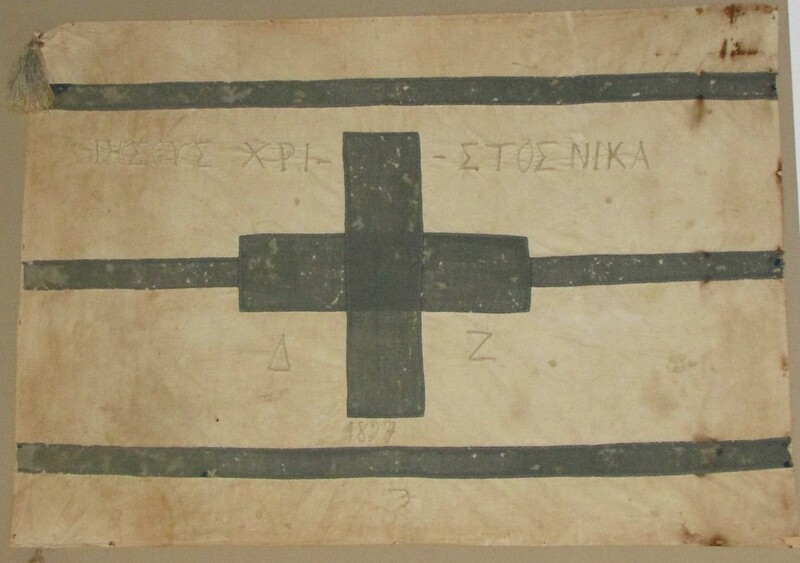 Flag of Kritiki Politeia, the Cretan State. Prince George adresses crowds in Canea. 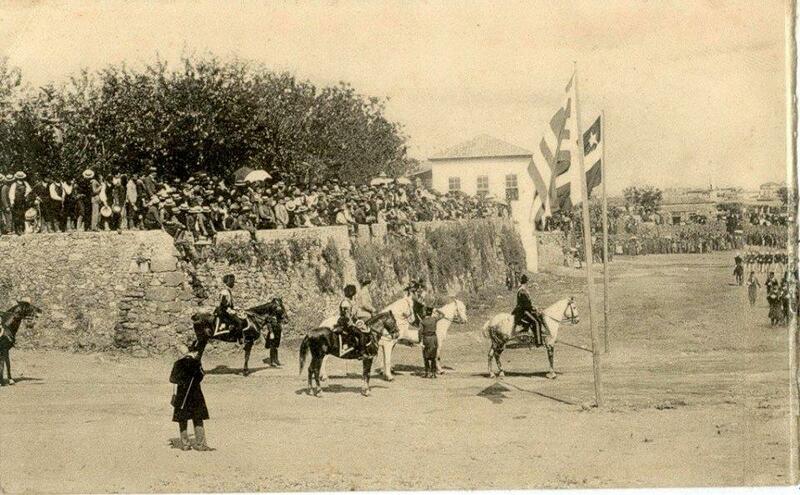 Arrival of Prince George in Candia (Iraklion) January 1899. Cretan Flag. Iraklion Historical Museum, October 2018. 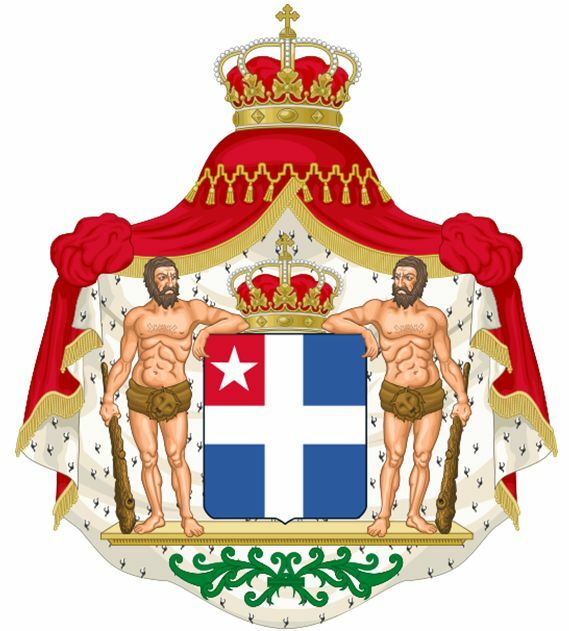 Coat of Arms of the Cretan State, Kritiki Politeia. 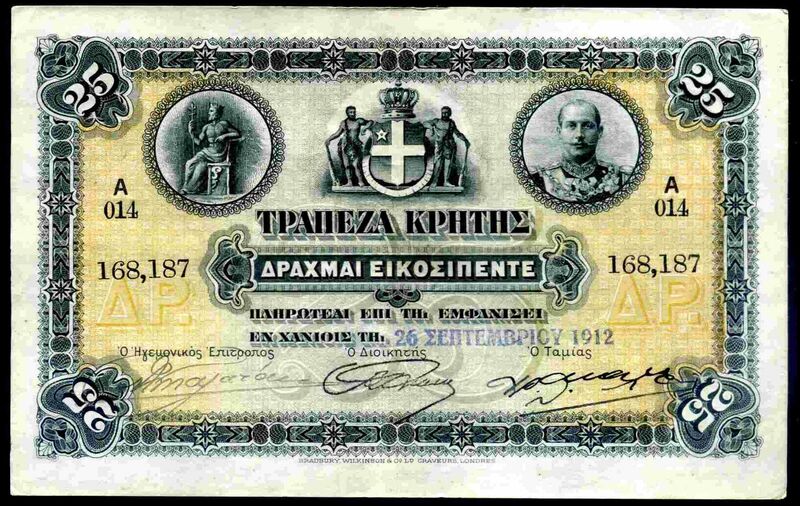 25 Drachma banknote, Kritiki Politeia. Princes George and Constantine of Greece reviewing parade in Canea. December 1902. 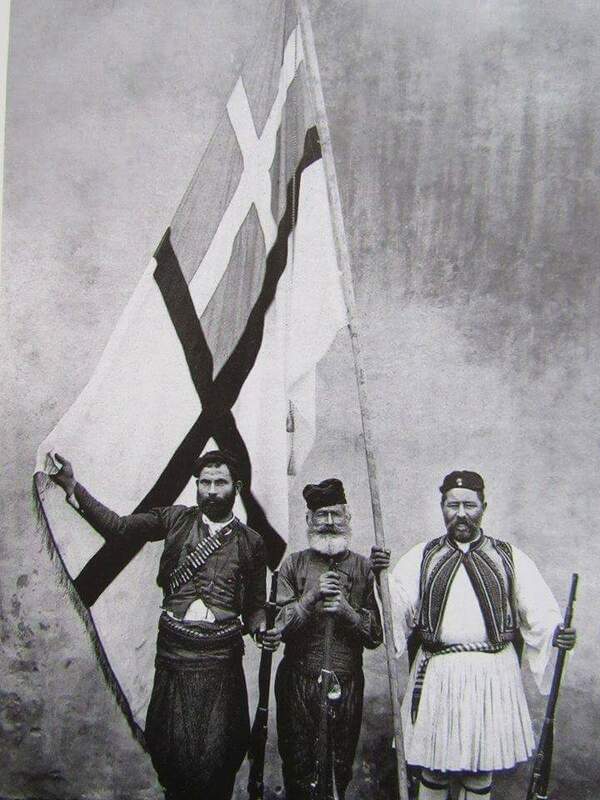 Theriso rebels with Greek flag,1905. British troops guarding flagpole. Firka, Canea August 1909. 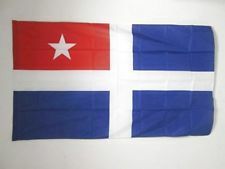 Melidoni flag, date and place uinknown. 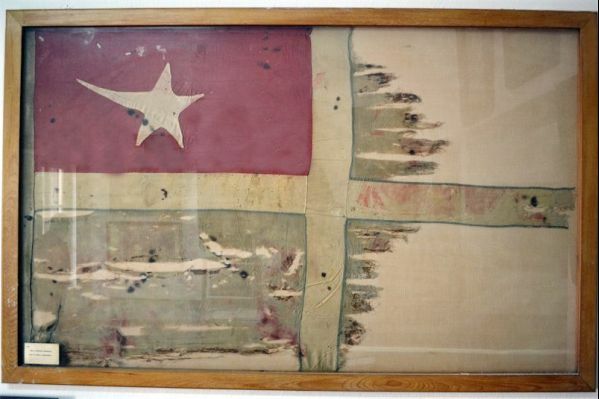 Star of Bethleham flag. Canea Archives. Photo courtesy of Zacarenia Simanderaki. Alternative ‘Star of Bethleham’ flag. Date and provenance unknown. Gendarmes with ‘Star of Bethlehem’ flag. 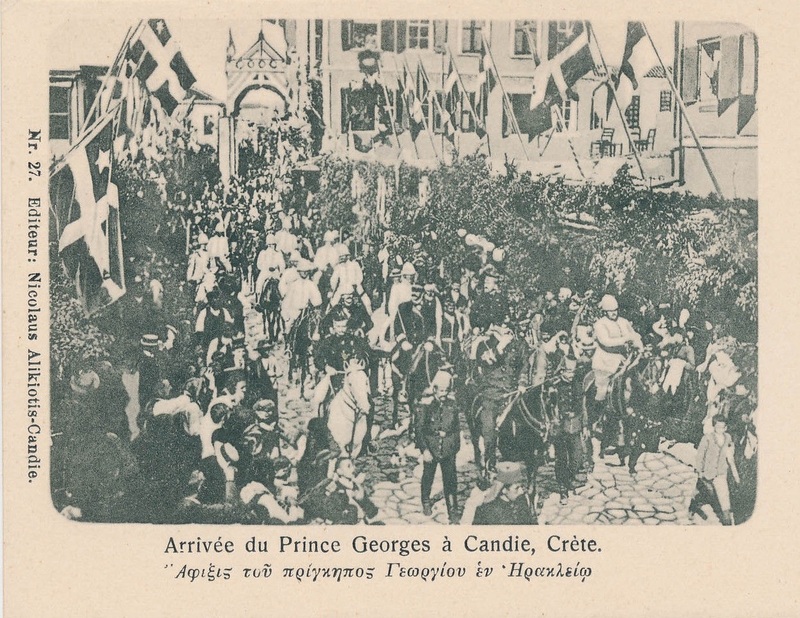 The arrival of Prince George on Crete. This entry was posted in Uncategorized on November 28, 2018 by Mick McT. 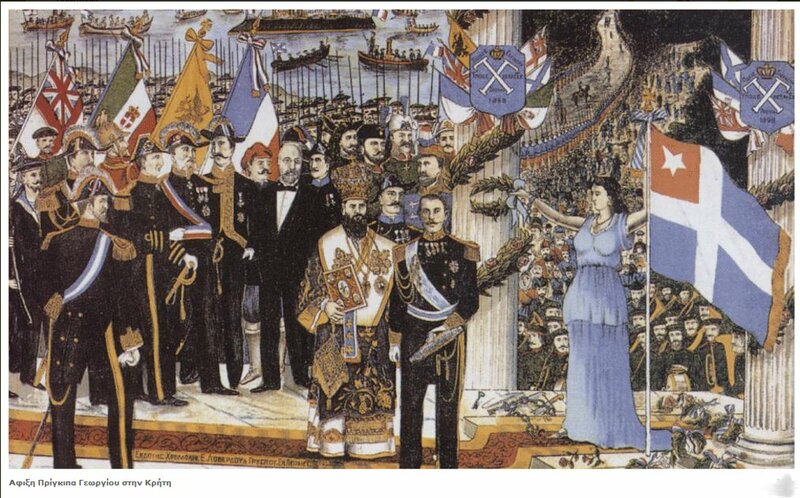 Prince George of Greece arrived on Crete in December 1898 to take up his role as the High Commissioner of the island. As well as choosing a High Commissioner for the Cretans, the European Powers also chose a flag for the island. 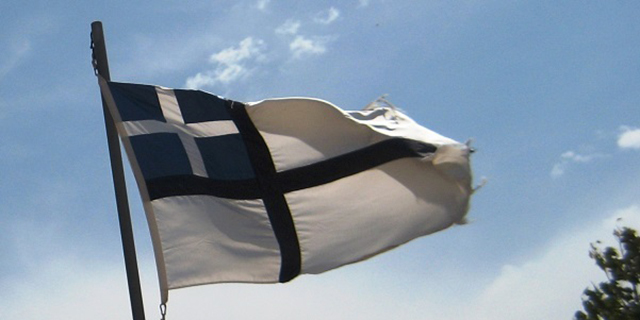 The three blue quarters of the flag and the white cross were considered to represent the Cretan Christian majority on the island, while the remaining red quarter, containing within it a five-pointed white star, represented the Cretan Muslim minority and the continuing de-jure claim to the island by the Ottoman Empire. 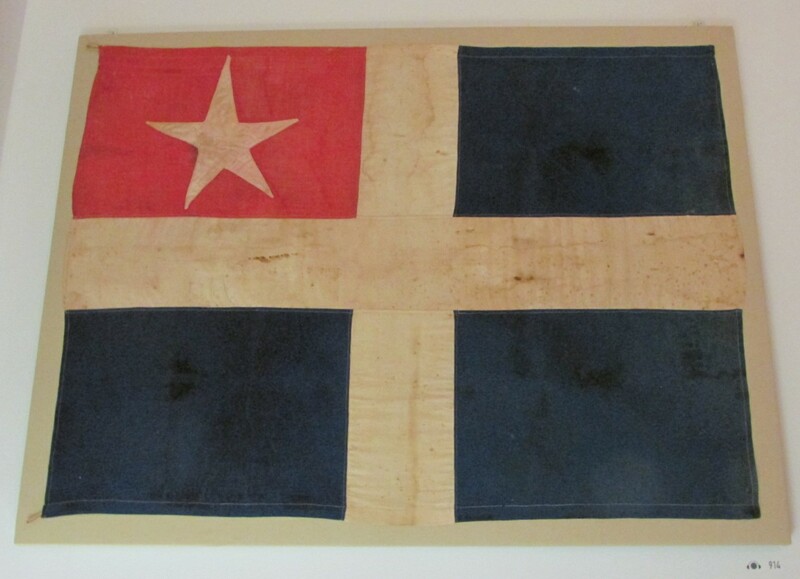 While the political implications of the status of the island proclaimed by the flag was, and in some quarters still is, contentious, flag makers and postcard producers were, and still are, quick to cash in on the opportunity to make money by selling souvenirs. Most of these, though somewhat tacky, at least managed to get the details of the flag correct. Not so the post-card shown below. 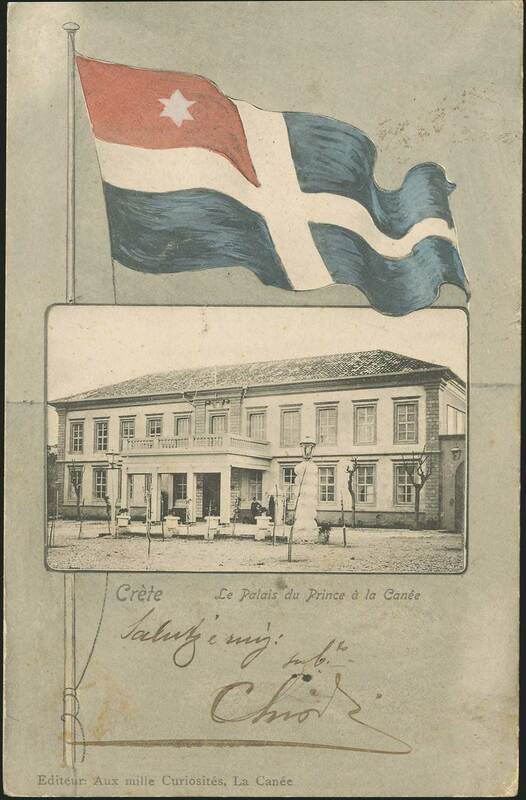 Produced by ‘The Publishers of a Thousand Curiosities’ in Canea at an unknown date, it shows a photograph of the Prince’s offices in Kastelli, above the port in Canea, surmounted by a, rather crude, six-pointed star. Quite why such an elementary error was made remains a mystery. The palace of Prince George and the, incorrect, flag of the Cretan Autonomous State. This entry was posted in Uncategorized and tagged Cretan Autonomous State, Cretan Flag 1898, Crete 1898, European Intervention Crete on July 10, 2018 by Mick McT. 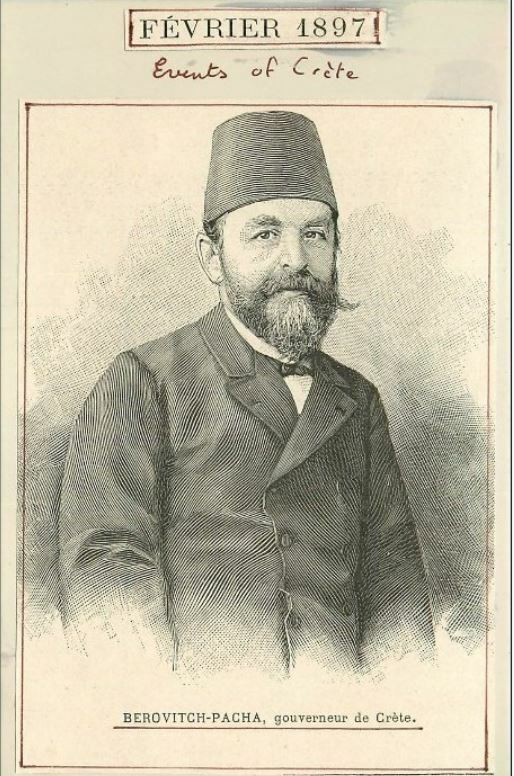 Djordje Berovich Pasha, the runaway Vali. 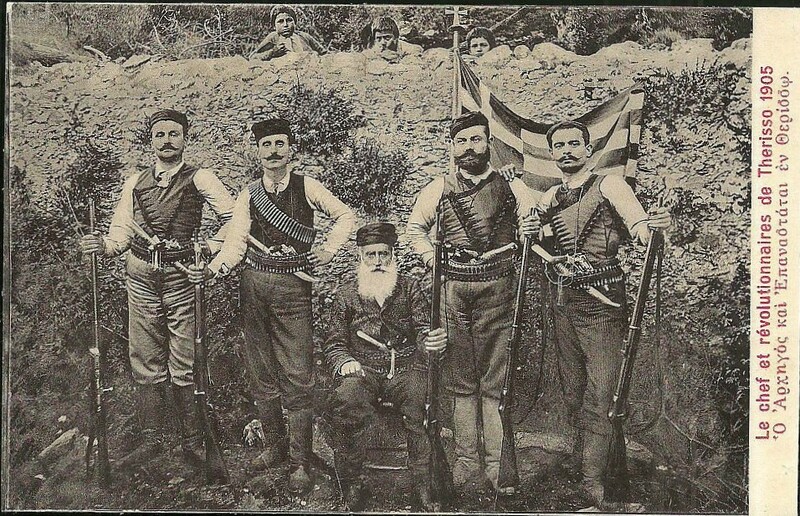 Complaints of the inefficiency of the Albanian gendarmes had resulted in 1896, in the recruitment of a ‘new’ force of Montenegrin gendarmes, initially under the command of Major J. H. Bor, Royal Marine Artillery. With this intake the ‘new’ gendarmerie consisted of three companies under the command of seven European officers; a total of 225 men made up of ninety six Albanians, eighty Montenegrins, fifty Cretan Christians, forty eight of whom promptly deserted to the rebels when the insurrection broke out, and thirty Muslim Cretans. 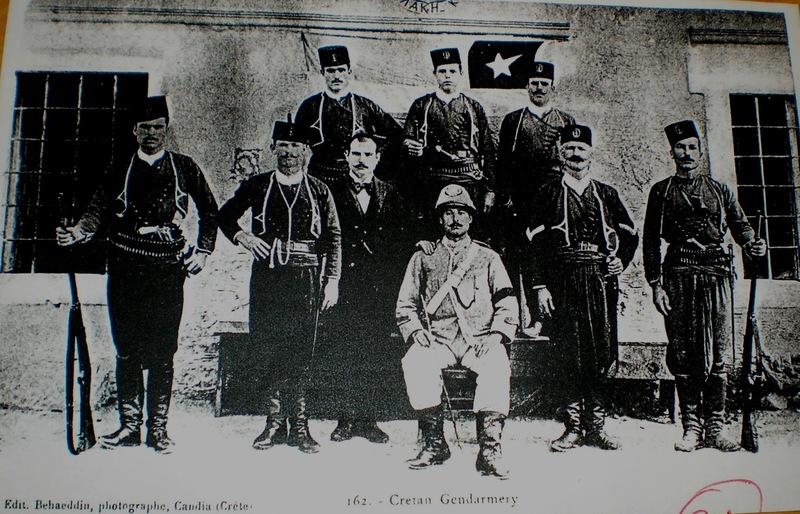 Proposals to reform the gendarmerie in order to make it a more representative body consisting of Cretan Christians and Muslims, agreed as a part of the Halepa Pact in 1878 but never implemented, were also being discussed by 1897 and any such reform would undoubtedly have impacted particularly on the jobs of the ‘old’ gendarmerie; another possible cause of the Albanians’ discontent. 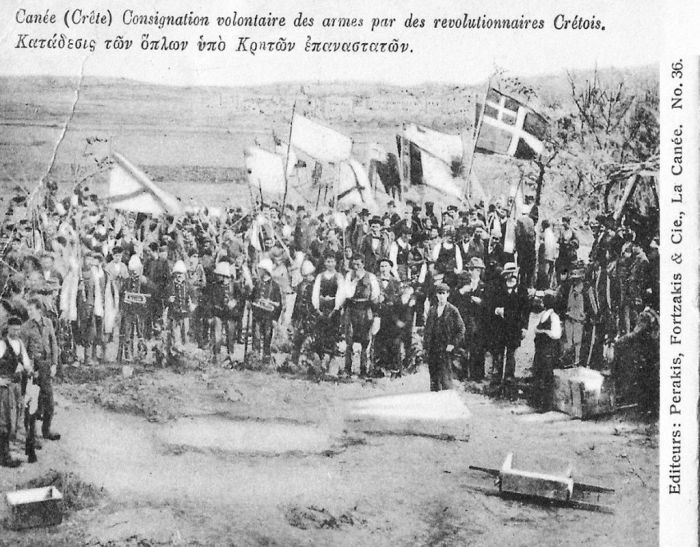 On the morning of 1st March 1897, Bor reported to the acting Vali that some forty men of the ‘old’ gendarmerie had refused to do their duty and were demanding that they receive their arrears of pay. A British reporter in Canea at that time, Ardern George Hulme–Beaman, stated in his diary that the dispute was the fault of ‘a few ruffians’ and that the arrears in question were some 18 months pay. During that day Bor saw a number of the mutineers individually and tried to persuade them to return to work, promising that they would be paid. 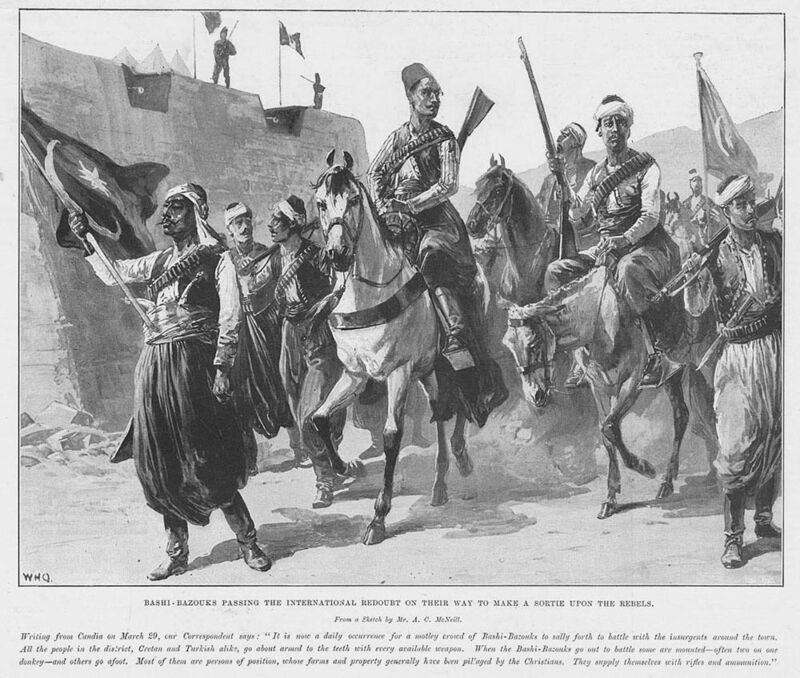 On two occasions that day he also went to the gendarmes barracks, in the company of Colonel Suleiman Bey, the Albanian commander of the gendarmes, to speak to the men en masse in an attempt to persuade them to resume their duties, but to no avail: On the latter occasion an altercation broke out between Suleiman Bey and one of the mutineers when Suleiman Bey pushed the man who was being insubordinate and talking excitedly; an altercation which came to an end when the mutineers grabbed their rifles and said ‘they would have no force used.’  The mutineers also attempted to kidnap one of their own officers, Major Mehmeh Agha, who had to be rescued from the barracks by Major Craveri, an Italian officer serving in the gendarmerie. The following morning, 2 March, Bor was summoned to meet the Admirals of the Great Powers and went to the Italian Battleship ‘Stromboli’ to do so. In his report to the Governor-General, Bor states that the Admirals approved his suggestion that, there being rumours of the mutineers intending to commit acts of violence in furtherance of their pay dispute, the gendarmes be disarmed at bayonet point by troops from the Great Powers. Accordingly Bor returned to the gendarmes barracks accompanied by a force of Italian and Russian sailors under the command of the Italian Captain Amoretti. 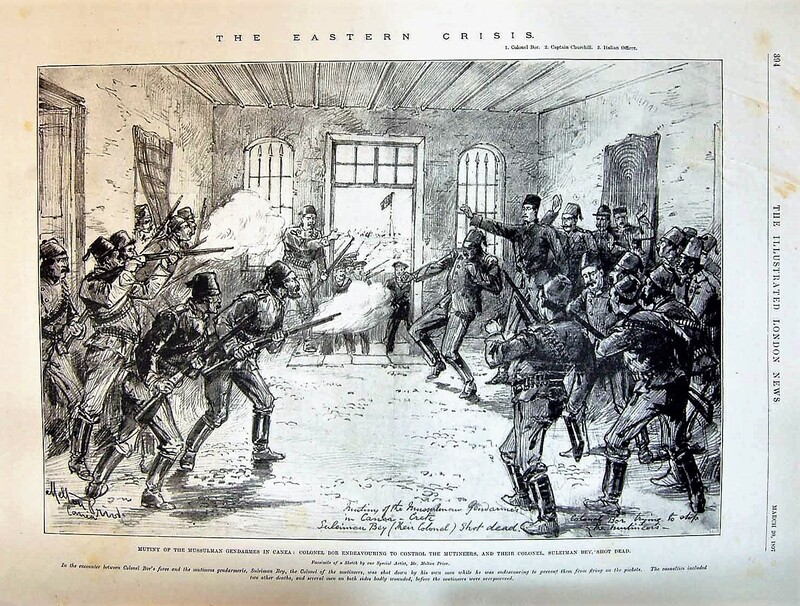 On reaching the barracks Bor first went inside, accompanied by Hulme–Beaman, and attempted once more to persuade the mutineers to return to work, promising them three months pay at once if they returned to their duty. This offer was refused. Bor and Colonel Sulieman Bey then went outside and only at this point did Bor inform Suleiman Bey of the plan to disarm his men. Having collected the International troops Bor and Suleiman Bey then re- entered the barracks, Bor going with one file of men to the refectory on the left hand side of the door, Suleiman Bey with his troops going to the one on the right. According to Bor’s account, three shots were fired at them almost immediately on their entering and the foreign sailors immediately returned fire from outside the doors. The gunfire continued for about a minute until the gendarmes retreated from the room and called out their surrender. The gendarmes, having suffered five wounded, one of whom later died, were then taken out of the barracks one by one and disarmed, this presumably being done by gendarmerie offices since Bor states that the foreign sailors did not enter the building. One Italian seaman was wounded but probably the most significant loss was the death of Colonel Suleiman Bey who was fatally wounded during the shooting and who died half an hour after. Suppression of Gendarmes’ mutiny. Soliel du Dimanche. 4 April 1897. Suppression of Gendarmes’ mutiny. La Tribuna Illustrata Della Domenica. 14 March 1897. The majority of the mutineers were exiled from Crete but not before being harangued by Major Bor! 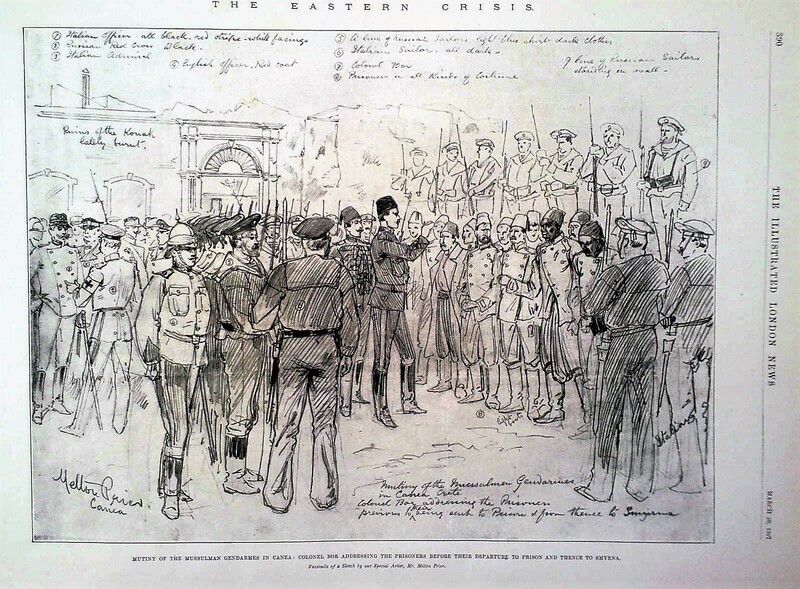 Major Bor haranguing captured mutineers prior to their removal from Crete. Illustrated London News, 20th March 1897. 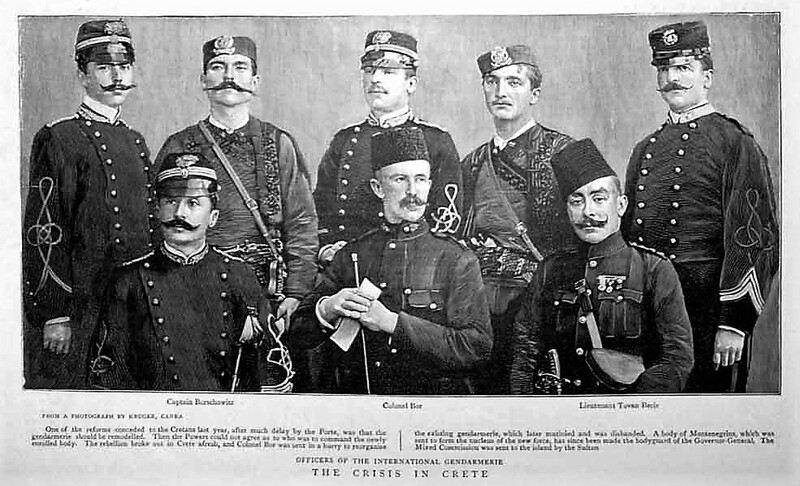 Their place was initially taken by four separate bodies, one for each of the sectors of European rule, until in 1899, Crete by now being an Autonomous State within the Ottoman Empire, the High Commissioner, Prince George, ordered a further reorganisation. 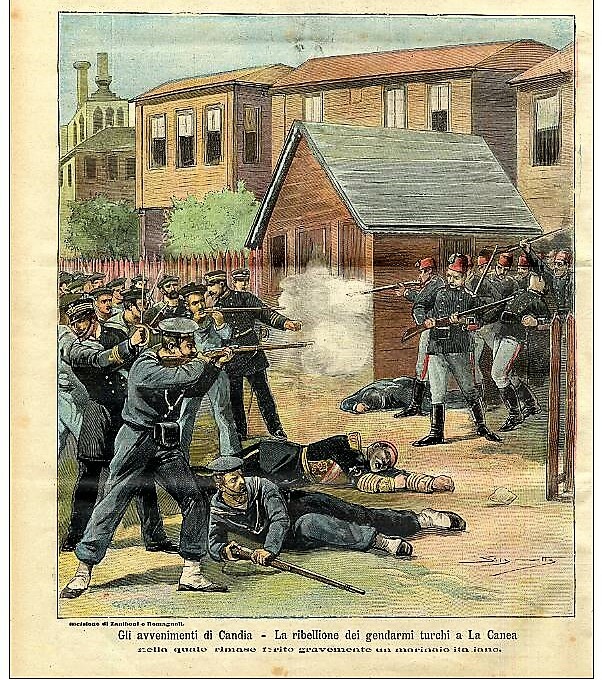 The four bodies were subsequently merged into one modelled on the Italian Carabinieri and commanded by Major Craveri. Rodogno D. (2012) Against Massacre: Humanitarian Interventions in the Ottoman Empire, 1815-1914. Princeton University Press. F.N. 37. Chapter 9. p.331. 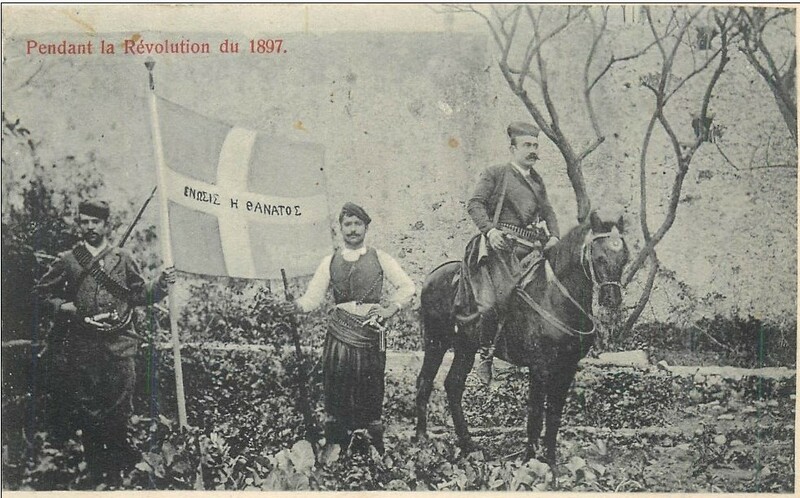 Colonel Bor to the Governor –General of Crete 3 March 1897. 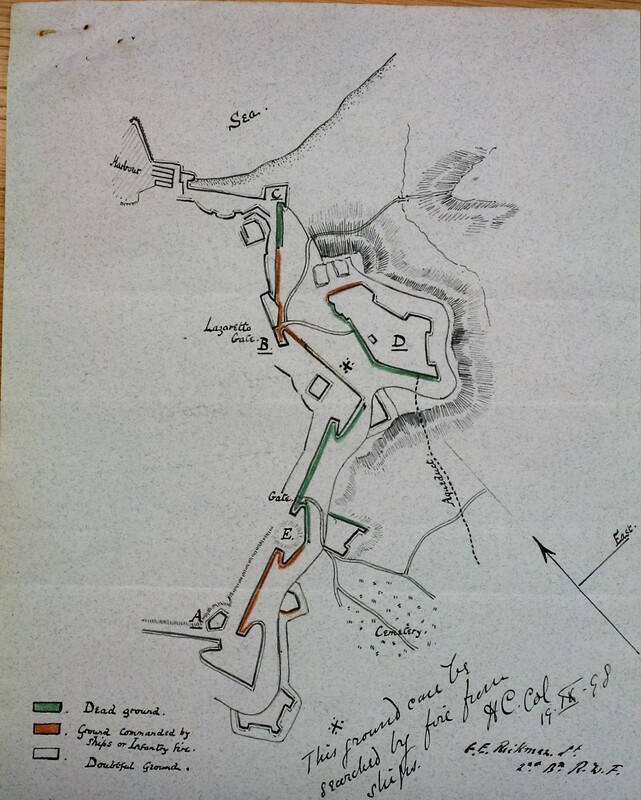 In inclosure No.3 Captain Custance to Rear Admiral Harris. House of Commons Papers. [C.8429] Turkey. No. 9 (1897). Reports on the situation in Crete. p.12. Hulme-Beaman.A.G. (1898) Twenty Years In The Near East. Metheun. London. p.258. This is not the first instance of Hulm-Beaman ‘demoting’ an officer. Throughout his account, he refers to Colonel Bor as Major Bor; the latter being his substantive British rank, the former his rank within the gendarmerie. Hulme-Beaman.A.G. (1898) Twenty Years In The Near East. Metheun. London. pp.260-262. 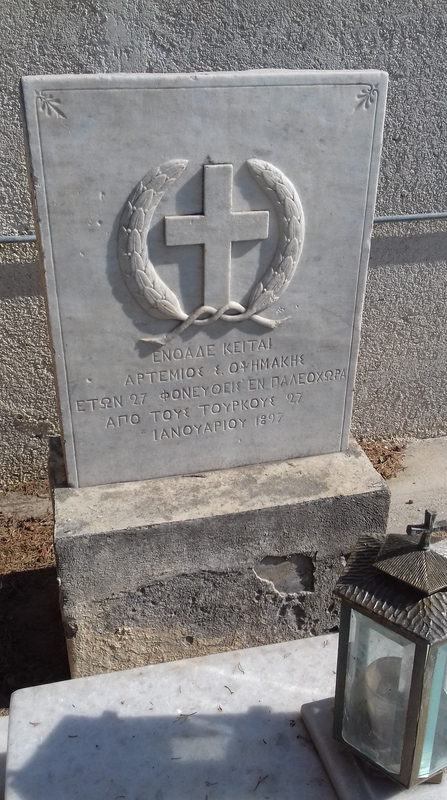 This entry was posted in Uncategorized and tagged Cretan gendarmerie 1897, Crete 1897, European Intervention Crete, Major Bor on July 6, 2018 by Mick McT. 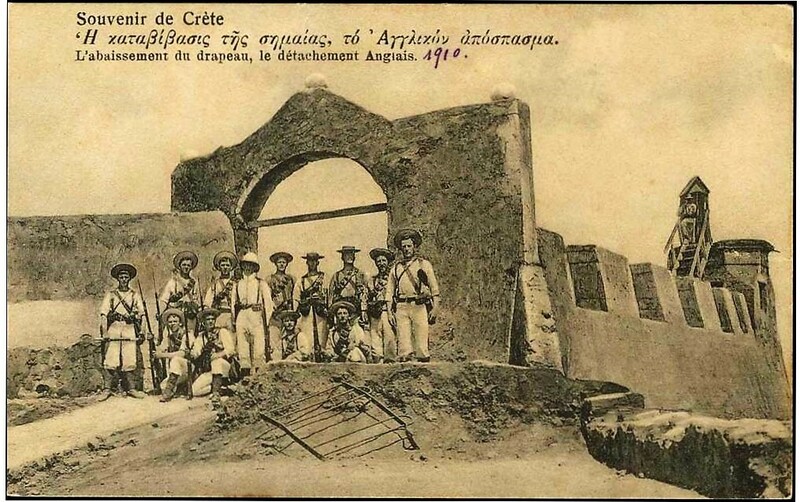 While European forces concentrated on the major towns on the northern coast of Crete, in the early stages of the Intervention the smaller town of Kastelli Kissamos, on the north western coast of Crete, was occupied by Ottoman forces. 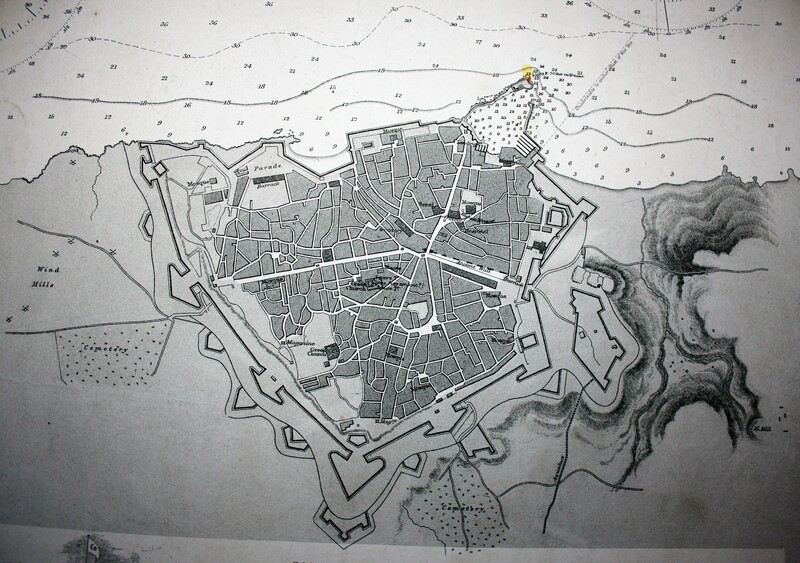 Partially because of the presence of smallpox in the town, the European role appears to have consisted of providing naval support for the Ottoman garrison. In March 1897 H.M.S. 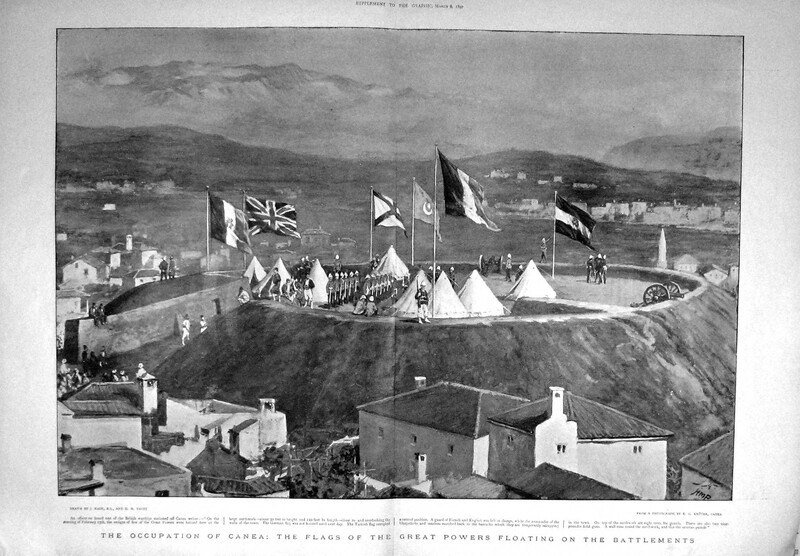 Rodney, under Austro-Hungarian command, the Austro-Hungarians still being part of the concert at this stage and responsible for naval activity around the western side of the island, became involved in discouraging Cretan Christians attacking the Ottoman garrison of the town. On 29th March 1897, the Captain of H.M.S. Rodney, W. Hewitt, reported to Admiral Harris that on the 28th after firing two rounds blank from her 6 pounder, the Rodney opened fire on Cretan Christian insurgents attempting to mine the walls of Kastelli Kissamos. In total some 13 rounds were fired at a distance of 2100 yards, with Rodney’s steam pinnace contributing a further four rounds from her 2 pounder gun. Over the following day two days, landing parties consisting of 200 British sailors and marines and 130 Austro-Hungarians went ashore to pull down the house near the Ottoman fortifications. 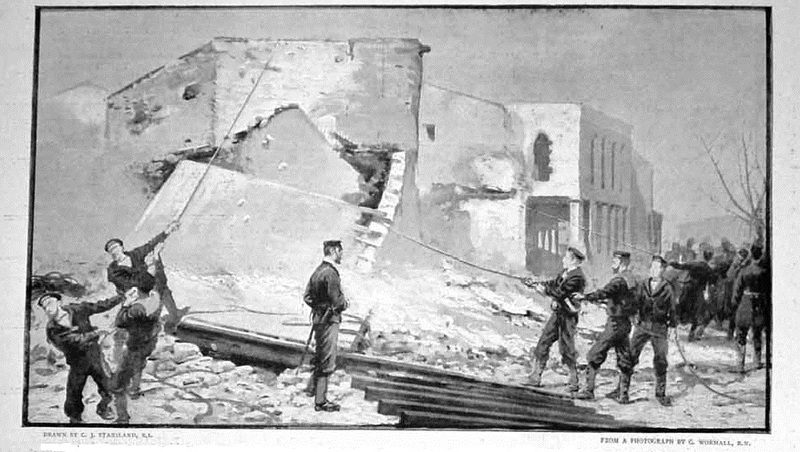 The accompanying text to the illustration below, taken from the Graphic of 24 April 1897, states that three houses were demolished to prevent their use by the insurgents. Demolition of houses in Kastelli Kissamos. A month later, on 9th April, the Royal navy was again in action off Kissamos. In company with, and under the command of S.M.S. Sebenico, H.M.S. 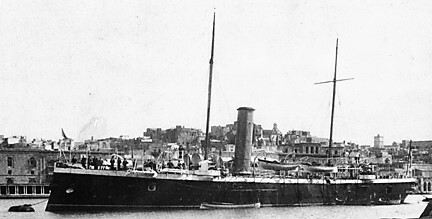 Fearless, a Scout Class Torpedo Cruiser captained by Commander Charles E. Gladstone, was involved in evacuating women and children from the Ottoman fort when their boats were fired on by insurgents. Both the Austro-Hungarian and the British ships opened fire to cover the embarkation. Over the next few days two Ottoman blockhouses were evacuated and one set on fire to destroy it, the other apparently had nothing flammable in it. 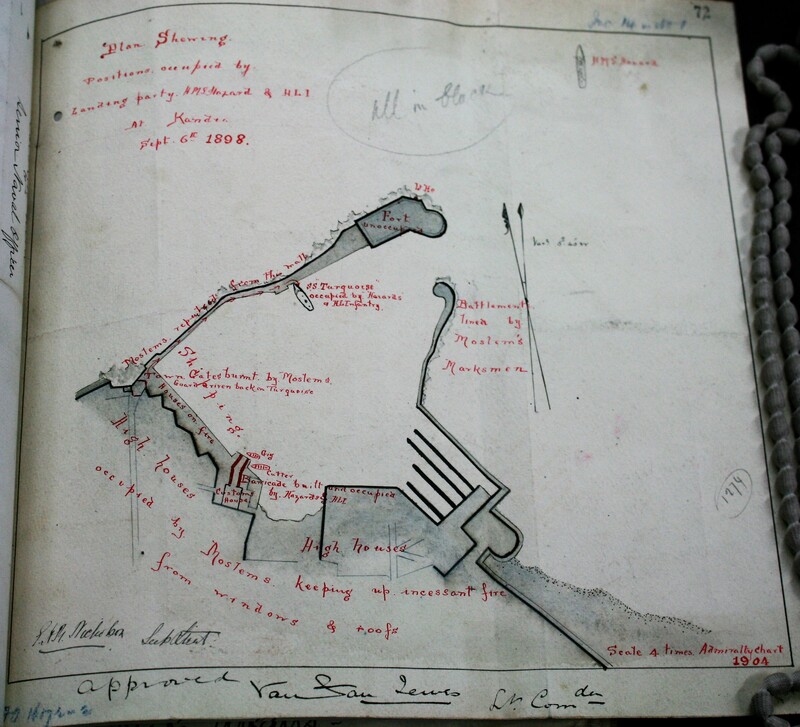 It was then decided to destroy the blockhouses by naval gunfire. National Archive. ADM 116/88. Enclosure 142. Rear Admiral Harris to Admiralty. 6th April 1897. National Archive. ADM 116/92. Enclosure 146.6. Captain W. Hewitt to Rear Admiral Harris. 29th March 1897. National Archive. ADM 116/92. Enclosure 185. Commander Gladstone to Rear Admiral Harris. 14th April 1897. This entry was posted in Uncategorized and tagged Crete 1897, HMS Fearless 1897, Kastelli Kissamos 1897, Ottomans in Crete, Royal Navy Crete 1897 on June 11, 2018 by Mick McT. 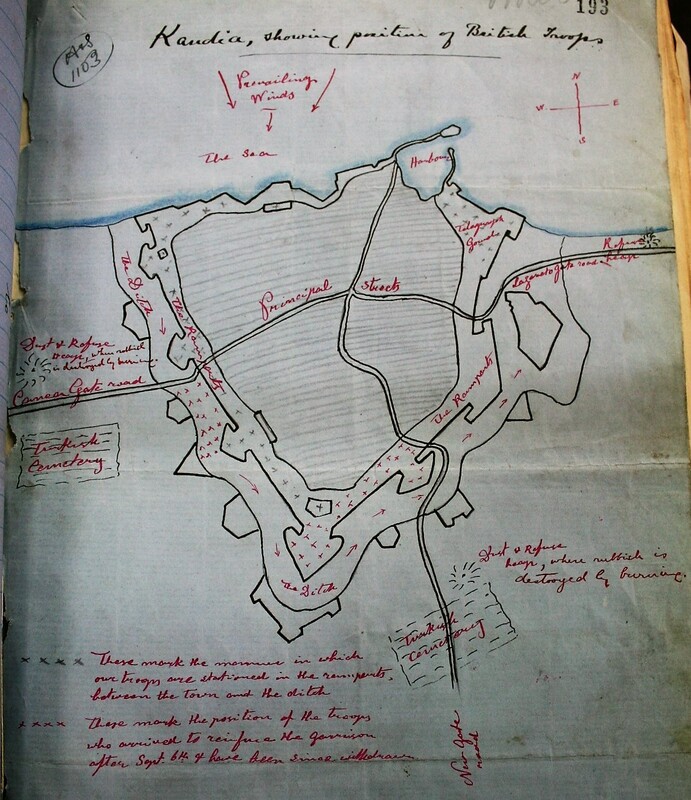 From their arrival in Crete in February 1897 until their departure in July 1909, British forces, of necessity, produced a number of formal, and informal, maps of Candia (Iraklion), the headquarters of the British Secteur of the island and main British base. Royal Navy Survey. Candia, 1898. Megalo Kastron or Candia. Candia September 1898 General Plan of town of Kandia. Produced by Sub. Lt. [G?] Nicholson R.N. as part of the report into the events of 6th September. 1898. Fields of fire, Candia 1898. 1898 map showing parts of eastern side of Candia which could be covered by fire from European ships and infantry. Drawn by Lt. F.E. Rickman 2nd Batt. Royal Welsh Fusiliers. Dated 19th September 1898, the map was produced as part of the contingency planning for the bombardment of Ottoman forces in Candia should they have refused to obey the Powers ultimatum to evacuate Crete. In the event, the Ottoman troops left without the necessity of force being used. Map showing the location of British reinforcements sent to Candia after the riots of 6th September 1897. British Military map. Candia 1905/1910. 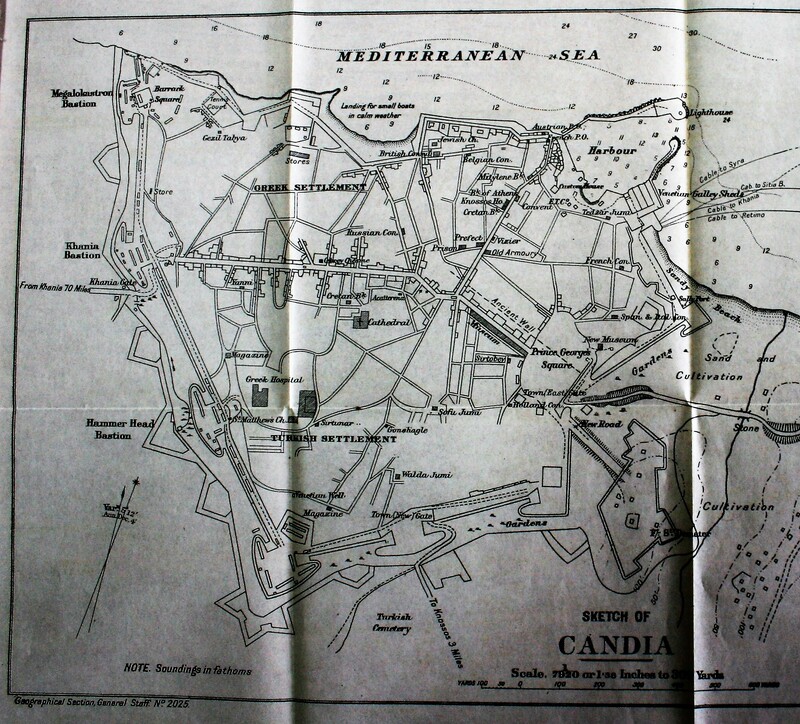 British War Office map of Candia. 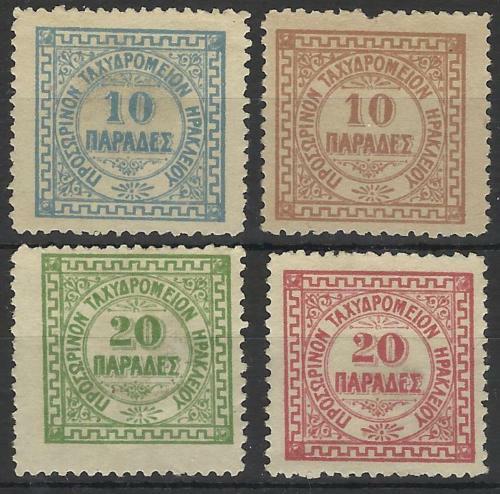 1905 with 1910 corrections. 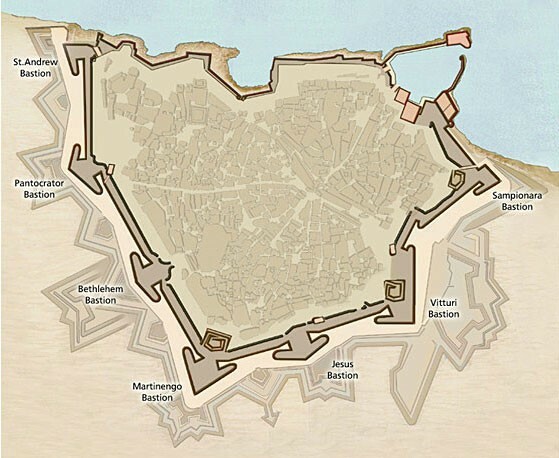 Modern map of Venetian walls of Iraklion/Candia/Khandia. This entry was posted in British Army in Crete, European Intervention Crete, Uncategorized and tagged Candia, Crete 1898, European Intervention Crete, Royal Welsh Fusiliers on November 27, 2017 by Mick McT.